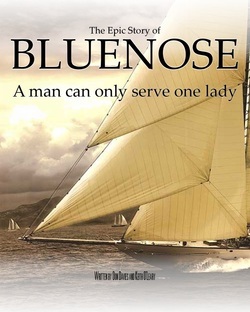 Bluenose is a major motion picture in the milieu of Titanic, The King’s Speech or Lincoln. It’s a compelling drama based on historical events. The facts of history are dry, but unchallenged. Bluenose was a Canadian fishing schooner built in Lunenburg, Nova Scotia and launched in 1921. Her Captain was Angus Walters, a thirty-nine year old sailor/fisherman who first went to the Grand Banks as a 13 year old crewing on his father’s ship. When he took command of Bluenose for her maiden voyage to the Grand Banks, he set a record for the number of fish caught in a season. At the end of the season, he won the elimination races against the other schooners in the Lunenburg fleet and represented Canada in the International Fisherman’s Trophy races of that year. Bluenose won that racing series and remained undefeated champion over the course of the next eighteen years. During that time, she defeated every challenger the Americans brought to the starting line. Her fame grew, as did that of Captain Walters and the ship building community of Lunenburg. Bluenose was enshrined on the Canadian dime and she remains there to this day. She sailed to Chicago to represent Canada at the 1933 World’s Fair. She sailed to England to celebrate King George V’s Silver Jubilee in 1935. She continued to sail to the Grand Banks to fish every year and endured many a storm and avoided the shoals and catastrophes that claimed so many other lives and ships. She was always the fastest back to port with the largest catch. She continued to beat the Americans in the fall classic races that had come to capture the emotion and imagination of all of North America...and, indeed, all maritime nations of the world. These are the glorious historical facts...but that is not our story. Our story takes place in the summer and fall of 1938. Steel trawlers with powerful diesel engines now speed to the Grand Banks. They can stay out for weeks and endure the foulest weather, avoid the shoals with their shallow draft, and return to port at twenty knots during a dead, flat calm. The days of the sailing schooner are numbered, and everyone knows it, except it seems Angus Walters and Bluenose. Like those other films based on history, Bluenose delves way beyond the facts into the hearts, minds and emotions of those who lived the story. And for Bluenose, there was much more to tell. A broken man and a water-logged ship. A twenty-six year old woman whose school girl crush on the famous Captain matures into love when she finally meets the fifty-six year old man. The agony of divided loyalties and the love a man can feel for both a woman and a ship. A challenge from the powerful and determined American consortium that wants to strip away the last remaining symbol of the glory that once was...Bluenose’s title as undefeated champion of the Atlantic fleet. The American challenger, Gertude L. Thebaud, is ten years younger and equipped with the latest sailing technology. Her Captain is a Newfoundlander known as the most relentless sail driver on the Atlantic. At stake is the International Fisherman’s Trophy and where it will reside for eternity. For there is no question, the days of the schooner are gone and this will be the last race for both ships. Bluenose is the real story that played out beneath the historical facts. It’s the raw, brawling anger of a shipbuilding community under threat of change. It’s a man and a ship battered by time and circumstance. It’s a young and beautiful woman and an incredible true love that endured until death. It’s the carpet-baggers and hangers-on who manipulate people, times and events to line their own pockets at the expense of those who seek only to challenge the raging sea; and others who share their fear and love for the unpredictable expanse of adventure that is an ocean. Visually, Bluenose is breath-taking, compelling, and irresistible. Anyone who has ever stood the decks of a sailing vessel under full press in a howling gale will never forget the experience. The lee rail under; awash with the powerful surge of the ocean clawing at your feet. Crawling on hands and knees through rattling machine gun rain to secure a flailing line. Canvas stretched beyond endurance; bending a towering Sitka Spruce mast close to the breaking point. The wind’s terrifying, piercing scream through the rigging. The helmsman struggling with all the strength in exhausted arms to keep the wheel true to course. The youngest, strongest and bravest aloft like monkeys, desperately clinging to yards and lines with the wind threatening to tear them away and toss them into the sea or dash them a hundred feet to the deck below. Bluenose is danger, excitement, love, loyalty, deception, triumph, despair and a courageous battle against an enemy that can never be defeated...time. Bluenose is...one hell of a movie...and like many a great movie...it’s all true.